Prominent blogger and defender of Pres. Rody Duterte on social media, MJ Quiambao Reyes (MJ Reyes) made headlines anew on social media after she burned down Edwin Lacierda for speaking about the presence of "Chinese OFWs." In Twitter, Edwin Lacierda, the Presidential Spokesperson of former President Noynoy Aquino, posted the following statement which caught the attention of MJ Reyes. "We admire the president's swooning lapdog loyalty to China, overlord of the PH Province. He kowtows to China's harassment of our territory, to entry of Chinese OFWs & to Chinese onerous loans & conditions." MJ Reyes responded to Lacierda's tweet by simply giving Atty. 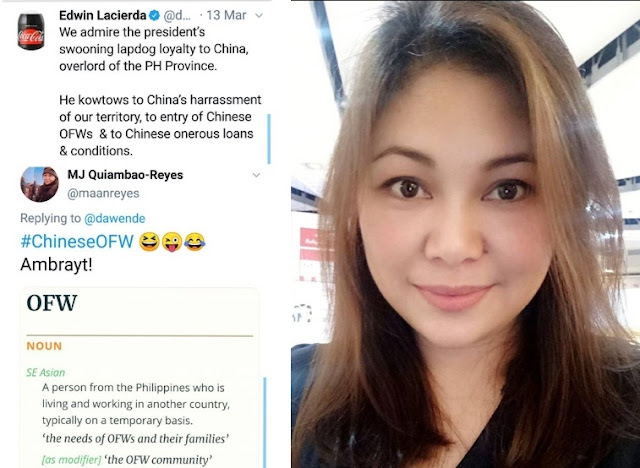 Lacierda the real meaning of OFW means Overseas Filipino Workers (OFW), so how come a Filipino Workers became Chinese citizens. Netizens who saw the post of MJ Reyes on Facebook reacted with the controversial post of Edwin Lacierda and ridiculed the veteran lawyer on social media. Joseph Embuscado Dela Cruz: Chinese Overseas Filipino Workers? ambrayt nga. Rosario de Vera: As an English teacher, I can spot people who try so hard to sound smart from a mile away. And they borrow words from each other.